Once upon a time, stress was an occasional response to stimuli. It was that rush of emotions that caused the fight or flight response when man was staring down a mortal threat, usually along the lines of charging saber tooth tiger or herd of buffalo. Today, stressors are all around and have put us. 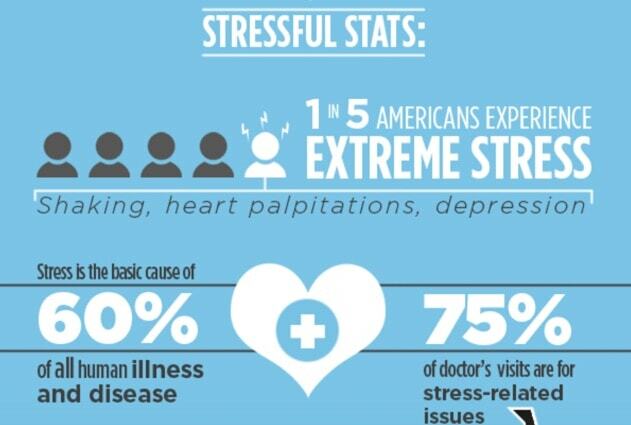 In fact, stress is the cause for 60% of all human illness and disease. We’re constantly connected to this stimuli, through phones, laptops, tablets, televisions, and more. If you ever feel like it’s too much, you’re not alone. Luckily there are many essential oils for stress and anxiety that we can turn to in times of need. I am going to go over a wide variety of those here, and by the time you’re done reading, you will know what oil to reach for to bring the calm you need right now. There are a bunch of them here, so there’s a good chance that you’ll have a few of them available. Let’s get you relaxed, shall we? What causes stress? Listen to your body. There are so many different levels of stress and types of stressors that it would be impossible to go over them all in the scope of a guide like this. Most people think of work or personal issues when they think of stress. While these are definitely correct, stressors can be emotional, physical, chemical, mental, or even environmental. Usually, things get overwhelming when it is a mix of the above. You know when things are getting to be too much, and when to take a step back. But you have to pay attention. The trick is to listen to your body. When it starts telling you that you need a break, don’t ignore it. When stress goes unchecked over prolonged periods of time, a lot of damage can be done. It is a major contributing factor to many chronic diseases, especially those of the cardiovascular system due to heightened cortisol levels. This unnatural response can lead to severe anxiety, high blood pressure, heart disease, and more. This list is not all-inclusive, but you get the idea. You know how you are normally. If you begin to react to things in odd ways or cannot recognize yourself or how you feel, it is time to intervene and get your stress levels under control before irreparable damage is done. Do essential oils work for anxiety and can they really provide stress relief? In 2004, researchers found that patients suffering from depression or anxiety received beneficial effects from essential oils selected for their particular symptoms. One problem that those suffering from Alzheimer’s have is known as behavioral and psychological symptoms in dementia (BPSD), which aromatherapy has been found to have positive effects in numerous studies. Researchers in the psychiatric department at Duke University Medical Center discovered that pleasant scents could alleviate tension and other problems arising from midlife crises in both sexes. In 1999, it was determined that aromatherapy massage increased the overall quality of life for palliative care cancer patients. Again, these are just a handful of results. Now let’s see how you can benefit at home. What are the absolute best essential oils for anxiety and stress? There are hundreds of volatile plant oils in production, even though you may only be aware of 40 or 50 of them. Because of the wide variety, I include typical, well-known oils in this list that you would expect, like lavender. However, you will also find lesser-known oils that may be new to you, like hyacinth (Hyacinthus orientalis). This way, you will have a good mix of oils that you know and love, as well as be able to find a few new favorites! Roman chamomile has a long history of bringing peace and relaxation to civilizations dating back as far as the ancient Moors, Egyptians, and Saxons. Many people drink chamomile tea in the evening to unwind after a hard day and to help them sleep. The flowers are made into remedies for digestion and nervous upset as well. Roman chamomile essential oil is an antidepressant, calmative, hypnotic, nervine, and has a sedating effect. German chamomile can be an excellent oil to have in your arsenal if you suffer from stress or anxiety. In fact, according to the National Center for Complementary and Integrative Health (NCCIH), preliminary studies have shown that people suffering from generalized anxiety disorder could benefit from chamomile supplements. Lavender oil is probably the most well-known and familiar of all of the essential oils. Even people unaware of aromatherapy know the scent of lavender; it’s everywhere! Lavender is an antidepressant, calmative, hypotensive, nervine, and sedative. It can help with many types of stress and its symptoms, including depression, insomnia, anxiety, headaches, hypertension, and more. When you are looking for a stress-relieving oil, you can pretty much reach for any floral-based volatile you have. They all tend to have calming effects. Geranium, for instance, is much like lavender in that it is an antidepressant nervine. The oil is great for calming nervous tension and the pain of stress-induced neuralgia. Marjoram is so much more than just an herb that gets lost in the spice cabinet. The herb and its oil have many helpful properties ranging from having a soothing effect on the nervous system to helping soothe aching muscles. Marjoram essential oil is antispasmodic, calmative, and is a nervine sedative. Use it when sleep is evading you and to calm nerves and stress headaches. Anything that is useful for meditation is an excellent choice during times of stress. Frankincense is one such oil. It has a calming and grounding effect due to it being an antidepressant, calmative, nervine, and sedative. The oil is uplifting to the mood, can relax you after a hard day, and helps promote peaceful sleep. Cedarwood atlas is a grounding oil that is perfect as a base fixative in your relaxing blends. The oil is a tonic and sedative to the central nervous system. Use it during times that you notice the nervous tension settling in. Many citrus oils are helpful in times of emotional crisis, so if you like them, reach for what you have. Bergamot, in particular, is a potent antidepressant that can uplift your spirits instantly just from its bright and cheery scent. It is also considered a tonic and can be used to calm the nerves, reduce anxiety, and aid in sleep. Cardamom is one of the most popular spices in the Arab world. It has a long history of use, both culinary and medicinal. The essential oil of cardamom is uplifting and energizing to the mood, so is helpful in times of depression. It can be used to enhance clarity and focus when the mind is overwhelmed with too many stimuli as well. While rose is one of the most expensive oils in the world, it is well worth it to have some in your aromatherapy medicine chest (if you can afford it). This sensual oil has a multitude of uses and is especially helpful for women in times of stress, or for reproductive stressors and issues. It is an antidepressant, calmative, sedative, and an all-around tonic. You know a substance is likely to have a strong calming effect if it is not supposed to be used in conjunction with alcohol and other sedatives. The same warnings apply to clary sage essential oil. The oil can be helpful for depression, in times of emotional crisis, for panic and anxiety attacks, and is a wise addition to blends for restless sleep or insomnia. Ylang ylang essential oil can be helpful when sexual energy is waning due to stress around you. It is an aphrodisiac that can help you regain your romantic side. This oil goes well with many others, especially floral ones, so add a drop or two to your favorite citrus or floral blends to enhance their effects. Vetiver essential oil is one of the more pervasively pungent oils that can be too much for some people. It is highly effective, but you will likely want to use only a drop or two so that it does not overpower your blend. A bright and cheery scent, grapefruit essential oil is enough to perk up the air and mood in a diffuser by itself. When trying times are taking a toll on your body and both mental and physical exhaustion is setting in, the immunostimulant powers of this oil can perk you up and help supply the energy you need to power on. There are a variety of petitgrain oils produced from different citrus trees. Try to find the one produced from the C. aurantium for relieving symptoms of stress. This particular oil is an antidepressant, antispasmodic, and is a relaxing nerve tonic. It is one of the more popular ones used for stress-related conditions, whether they are of a physical or mental nature. This calming antidepressant nervine oil is helpful for the wild mood swings of premenstrual syndrome (PMS) for good reason; it works. Woman or not, the unique patchouli oil can help you maintain a calm demeanor whether your mother-in-law is in town or the boss is breathing down your neck. I cannot make a list of stress and anxiety-reducing oils without including the ancient gem of sandalwood, albeit with a caveat. East Indian sandalwood oil is steam distilled from the roots and heartwood of trees uprooted during rainy seasons when they are 30-40 years old, even though they could live for more than a century. They are overharvested, and this oil is rare and needs to be protected and used extremely sparingly. That being said, sandalwood oil is a calming nervine with sedating qualities. It is an overall tonic that has an affinity with not only the central nervous system but with pretty much every system in the body from the skin to the cardiovascular, respiratory, and skeletomuscular system. Another excellent oil for the nervous system is the Pacific or New Caledonian sandalwood. This wood has to mature to a minimum of 20 years before harvest, so again, care must be taken to protect against over harvesting and make certain replanting measures are in place to preserve it. However, like Indian sandalwood, the oil is particularly helpful for the nervous system and can be used for nervous exhaustion, insomnia, depression, and anxiety. Similar to this oil is the Australian sandalwood, Santalum spicatum. There are many industry measures there as well for the protection and longevity of this slow-growing crop. If you choose any of these three oils, please make sure they come from reliable and sustainable, legal sources. Melissa oil is one of the top essential oils for stress and is a great one to have on hand for anxiety. Even though it is one of the most frequently adulterated oils, true Melissa (or lemon balm) oil is a godsend for anyone with sleep disturbances, especially those caused by stress or female reproductive issues, such as menopause. Lemon balm can not only help you get the much-needed sleep you are craving, it can calm the nerves, aid in alleviating anxiety and panic attacks, ease symptoms of depression, and bring tranquil relief when life gets to be too much. Stress-related conditions can be eased, and nervous tension melted away when cypress essential oil is added to the mix. For muscular aches when you are dead tired from a hard day, a bath with a little cypress, cardamom, and marjoram will get you relaxed and ready to sleep like a baby. Did you ever wonder why a cold beer can be so relaxing after a hard day? A lot of that likely has something to do with one of its main ingredients, the hops. If your body physically reacts to stress in the form of headaches, neuralgia, tension, and insomnia or sleep disturbances, add a little hops to citrus or spice blends for relief. While this oil is a hypnotic and sedating nervine, it is also an aphrodisiac, so this may be something to keep in mind. When depression is setting in, and life seems bleak, jasmine can bring light back into your world. It is an antidepressant oil with sedating qualities that can provide optimism and confidence when they are needed the most. To top it off, true jasmine essential oil is an aphrodisiac, so it can brighten your evenings as well as the rest of your day. This is one of the best essential oils for anxiety, as it has a particularly calming effect on the nervous system. In the 1980s, the herb was documented as having similar effects to small doses of benzodiazepines or barbiturates for sleep issues. Valerian root is listed in the British Herbal Pharmacopoeia for ‘conditions presenting nervous excitability.’ It is a mild anodyne and a central nervous system depressant, so can ease pain and quiet the mind. Use it for indigestion caused by stress, insomnia, migraines, restlessness, anxiety, or tense states. Please note that this oil is not to be used in conjunction with antidepressant medications or sedatives. Neroli essential oil, named after an Italian princess of Nerola, is an aphrodisiac that is said to ease sexual apprehension. It was often used by brides to calm their nerves prior to consummating the marriage on their wedding night, and is associated with fidelity. The oil is also an antidepressant, being capable of lifting the spirits with its brightly radiant floral aroma. It is an excellent choice in times of depression or convalescence, sleep disorders or insomnia, tension, anxiety, or emotional exhaustion. A word of caution, be sure to source neroli from a trusted supplier. It takes approximately 220 pounds of blossoms to distill 2 ½ ounces of the oil, so it is often adulterated with fillers. Purifying with benzoin was believed to ward off evil spirits, and today benzoin can be used to calm the demons within. It is toning to the circulatory system in that it can warm the heart and soul, bringing a welcome peace to an otherwise turbulent and cold day or mindset. Use benzoin to melt away stress and tension. You may recognize cananga from the botanical name of ylang ylang. They are from the same family, and some unscrupulous suppliers will substitute the less-floral cananga for the more delicate ylang ylang. We all know that aromatherapy is not always about what smells the best so, perfumery aside, cananga definitely has its place for stress-related conditions. The oil is beneficial for its antidepressant, antispasmodic, calming, and sedative effects. It is also hypotensive. Use cananga for stress-related complaints ranging from anxiety and depression to musculoskeletal nervous tension and pain. As with other florals, carnation absolute is therapeutic for all things emotional. Whether you are burning yourself out at work, holding your feelings in, feeling alone in the world or just cannot seem to shut your mind off, turn to carnation. Please note that tangerine essential oil and mandarin oil are two distinct oils with different properties, even though they are often used interchangeably. I am only combining them into one entry because they not only share a botanical name but many therapeutic benefits as well. Either of these oils can be used for stress-related issues, especially insomnia, nervous exhaustion and tension, fatigue, restlessness, and anxiety. Always pay attention to the botanical name when purchasing essential oils. It is imperative to know that you are getting the correct one, especially when some sound so similar as it is with chamomiles. This particular chamomile is great for easing cramping and spasms, anxiety and irritability, insomnia and sleep disturbances, as well as headaches and migraines. This antidepressant oil that you probably have never heard of is also a nervine and tonic. It is also a stimulating oil and under certain circumstances, could become your best friend. The oil is an aphrodisiac, helpful for impotence and lack of sexual desire. Let’s face it, stress can do that, but essential oils can help. The next time your relationship begins to suffer because of day to day stress overwhelming one or the both of you, try a little damiana in a blend with other aphrodisiacs like ylang ylang, rose, jasmine, sandalwood, or patchouli. This oil has a wealth of benefits for relieving stress. It is an antidepressant, antispasmodic, calmative, hypnotic, nervine, sedative, and tonic. These qualities make the oil, also known as cabbage rose, rose absolute or Rose de Mai, excellent for a wide variety of issues including frigidity or impotence, depression and anxiety, headaches or insomnia, and even phobia relief. If you can find a hyacinth oil or absolute that has not been adulterated, treasure it. You can use it to unwind, meditate, induce self-hypnosis, and bring out your creative side. What scent brings up more fond memories for many people than the sweet warmth of vanilla? This thick and viscous absolute is helpful for relaxing the tension of many stress-induced conditions. If your stomach does flip-flops when your nerves are going crazy, and you feel like your lunch isn’t going to stay put, try vanilla to calm the waves and relax. This plant is associated with Shiva, the Hindu god, and the blossoms are used in Ayurvedic medicine. Even though Davana oil is often used in perfumery and as a flavoring, you can use it at home for relief from indigestion, nausea, anxiety, tension, irritability, and generalized stress conditions. Hyssop has an affinity for easing respiratory and digestive symptoms, but is also beneficial for the circulatory and nervous systems. It is especially helpful for blood pressure issues, as it is a hypertensive and a tonic to the heart and cardiovascular system. When you source hyssop essential oil, be sure to choose Hyssop officinalis var. decumbens, as it is more suited to home use and less toxic than other varieties. Helichrysum essential oil is a stimulating oil that should not be used for extended periods of time. However, it can be helpful when lethargy and depression are dragging you down. Diffuse the oil during these times, or add to massage blends to help eradicate nervous exhaustion, neuralgia, and muscular aches and pains. Lemon essential oil is one of the best mood lifters, as well as one of the most studied for that effect. Citrus oils in general are great mood enhancers and help beat the blues, and lemon is one of the best. It is an invigorating and uplifting antidepressant that can boost levels of serotonin and dopamine as well as reduce anxiety. This oil is a perfect choice for seasonal affective disorder (SAD) or when you need a happy lift any other time of the year. Last but certainly not least is one of the more popular oils: peppermint essential oil. This cool volatile excels at calming headaches that often arise from too much tension. Put a drop or two in half a teaspoon of carrier oil and rub it on your temples and the nape of your neck for relief. It is also very helpful in times of mental and physical exhaustion, plus can calm tummy troubles when the physical symptoms of stress present themselves through your digestive system. This list is by no means exhaustive, and it is not set in stone. If you have a favorite oil that you know relaxes you, then by all means, use it. Now that you have a great selection of natural oils to choose from, I’ll show you how to put some of them together for some powerful relief. Remember there is no concrete answer as to where to apply what oil to ease what symptom. They are highly personal, but the following tips and recipes for anxiety and stress should get you off to a good start. We also have an extremely through article on how to use essential oils that you can read for further knowledge. Diffuser: Add the required amount of drops per your manufacturer instructions. Massage or body oil: Use 3-5 drops per teaspoon of a carrier oil. Bath: Mix 5-6 drops in a tablespoon of Epsom salts, fine ground herbs, powdered milk, aloe vera gel, a carrier oil, shampoo, or bubble bath. Inhalation: One or two drops on a tissue or cotton ball will be perfect for you to carry around and use throughout the day when needed. For the following blends, pick ones that have ingredients whose actions closely resemble the results you want. Refer to the above list for each oil’s uses and botanical names for clarification, if necessary. Unfortunately, stress and anxiety are a part of our everyday lives. No matter how well you deal with things, there are times when it all just gets to be too much. Listen to your body, acknowledge when you need to take a break, and tell yourself it is okay to do so. More importantly, take the time-out you may have been putting off. Essential oils can help you unwind and have the power to help you release the pent up tension, brighten your mood, or give you the much-needed sleep you’ve been lacking. You just have to give them the chance to work. Did you see some of your favorite oils on here? Maybe you learned of some new ones or have a go-to that I missed? Thank you so much for this article. I just started using essential oils and have been a sponge with absorbing all the information I can get on a variety of health issues. This is very informative and important information and I like how you touch upon some research. It is very depressing that doctors don’t learn more about essential oils and their uses to better help people! !